As you know your bills will be higher in winter, so maybe it’s time to shop around again and make sure you’ve got the best deal? You might save yourself some cash – just think, that’s more spare dosh for Christmas present shopping! If you have a specific room prone to getting a little damp, before the weather turns, make sure you move your furniture and objects away from the walls to allow the air to circulate and for the room to be a more consistent temperature throughout. Still got your garden furniture out? You might not need those until Spring so make sure you cover them to protect them from rust in the coming months. Change your thermostat ready for winter. You can set it to be lower when you’re not home and to get warmer just before you get in. With more regular heating, you’re saving your home from problems developing, like cracks and burst pipes, if the temperature changes too quickly. It may seem a trivial thing to think about, but to save you losing heat, try these two home hacks: get out the sewing machine and line your curtains and add reflective foil behind your radiators on walls which are external on the other side. These simple hacks will help keep heat in. Invest in three simple items – a draught excluder, a draught-excluding letter box and a rug for any wooden flooring you have to keep your home snug this winter. This is the time to go around your home and check your gutters are leaf-free, the boiler’s healthy and to bleed your radiators in preparation for winter – it’s better to do it now than get caught out when the temperature’s a bit lower. Have you checked the roof? Cracks or broken tiles can let in water and lead to damp so make sure you, or a professional, gets up there whilst it’s still dry and light and check it over. Think about all of the places where heat could be escaping from your home this winter – the windows and doors, the loft, the conservatory? Have you got adequate insulation? If not, is it time to invest? Cavity insulation and getting double-glazing, to keep damp and mould at bay, may be a good option. 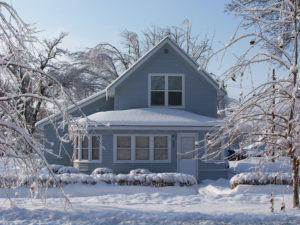 Trim back any larger trees around the property and drive as, with cold weather comes ice, and you don’t want any of the branches falling onto your home or car. Make sure you’ve winter-proofed your home so you can sit back, relax and enjoy the winter season – finger crossed, we might even get some snow!